As the replacement of electronic products faster and faster, people change their mobile phones much more frequently. As the phone makes technological advances it is becoming more and more common for a person to store personal and business contact information on their phone. For this reason, user to need to master some useful approaches to copy contacts from your Samsung Galaxy to new iPhone 6. The most commonly used method is to connect the old phone to the computer, and to transfer the contacts to the computer. But this method often has many disadvantages. First of all, this method needs a lot of steps, this method can only transfer limited information of the contacts, while other significant information is ignored. What's more, some apps allow users to manually share contacts one by one; sadly, you can only share one contact at a time. It would take much time if you have hundreds or thousands of contacts to be shared. Aiming to overcome the shortcomings of the ordinary approach, it has developed a unique data transferring technology. After installed on your computer, the old and new phones are connected to one computer at the same time. These two phones are supposed to operate at the same time. It will automatically identify the phone models; and then it will list all the data that can be copied and transferred. You only need to select the corresponding data according to your requirements. 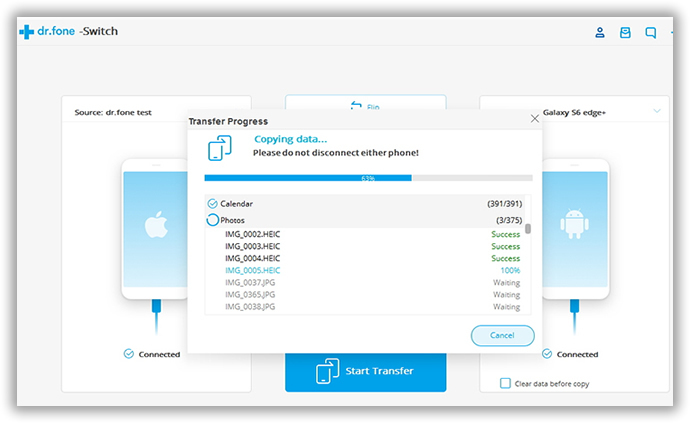 Phone Transfer will not only copy and transfer the names and phone numbers, but also will transfer a lot of important information to the new phone, such as email address, company name, job title, etc. With this app, you only need to follow the clear and concise instructions on the guide. 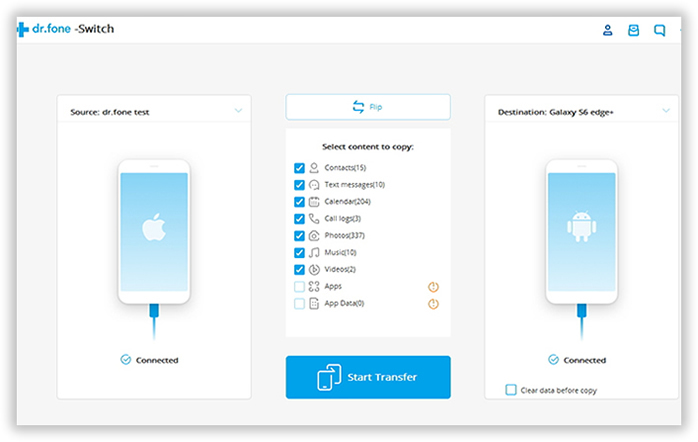 Run the Samsung to iPhone data transfer tool on the computer. In the first window, click Switch button to enter the Android to iPhone transfer window. Connect both of your iPhone and Samsung phone to PC by using USB cables. Both devices will be instantly detected, then show all internal data in the panel. 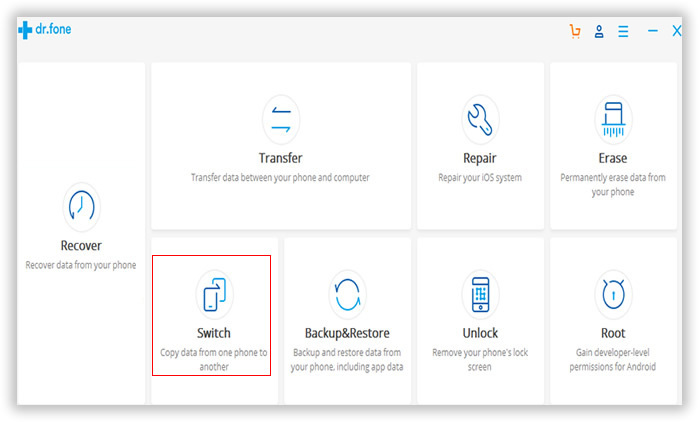 Make sure that your cell phone's sim card is inside of the two phones, the program will detect your Samsung galaxy phone and automatically load the data from it and then are displayed in the window below. Select the files and make sure what will be transferred. Note: You can click the “Flip” button to change the place between the Source and Destination. Check Contacts item from the displayed list and click Start Transfer to start the transfer process. It takes a few minutes to finish the whole process. There will be a dialog box pops up, showing you the percentage of the progress bar. Never disconnect two devices during the process. Then Access your contacts as seen from step, your new contacts should be on iPhone device. What Are The Specialties of Mobile Phone Transfer? Compared with other programs, this Phone Transfer is special in many aspects. It is capable to transfer various types of data, such as text messages, photos, apps, contacts, etc. Besides, it supports over three thousand phones and networks. It provides customers with clear operation instructions and user-friendly interface. Even computer novice can do it in one click. This program also ensures the integrity and security of the transferring contacts. What is your best companion to move all phone number from Samsung Galaxy to Apple iPhone device? Of course Androidsoft Phone Transfer program, with its advanced technology and smart design, it helps people make their life much more effective and simple. Don't hesitate to try it yourself.